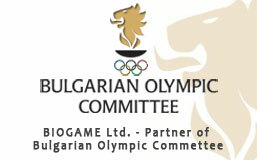 BIOGAME Ltd. was founded in 1990. It has grown dynamically and at the moment is undoubtedly the leader of Bulgarian food supplements manufacturers. 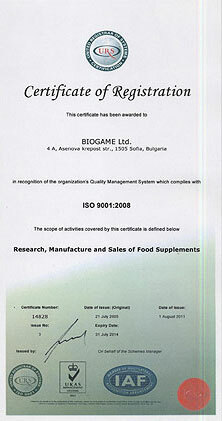 In 2005 Biogame successfully implemented a system for quality control ISO 9001-2000. The Certification is a result of the international audit, realized by the British company United Register of Systems Ltd. In 2011 the Certificate was renewed in version ISO 9001–2008. Evidence of the high standards of BIOGAME Ltd. is also the fact that the company exports products to countries of the European Union as well as in Serbia, Turkey, Romania, Macedonia, Uzbekistan, Kuwait, Vietnam, Sudan etc. In 2003 the National Branch Chamber of Commerce of distributors of pharmaceutical products awarded BIOGAME Ltd. with a diploma and the prize "Enyo" for contribution in medicine politics. In 2004 BIOGAME Ltd. received the prize "Enyo" again for contribution into medical politics with the creation of the product Amino Acid 3800.
and Mr. Plamen Krastev (right).